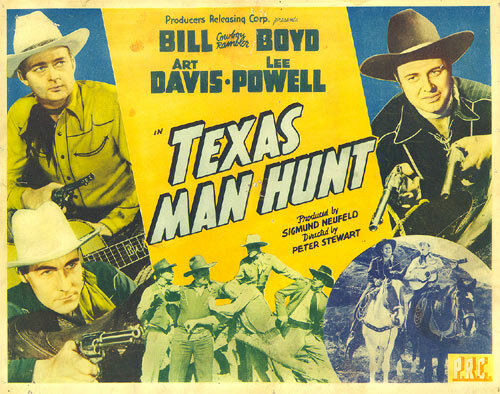 “TEXAS MANHUNT” (‘42 PRC) First and most coherent in the Frontier Marshals series starring Lee Powell, Art Davis and Bill “Cowboy Rambler” Boyd. A stock footage wave of cattle sabotage (designed to halt the Allied food supply) instigated by Nazi spies brings U.S. Marshal Lee Powell to Pebble Creek, TX. With war victims in Europe starving, Powell must stop the saboteurs. His first clues come from cute beanery owner Julie Duncan and radio entertainers and “cowboy commentators” Art Davis and Bill Boyd (who perform 7 songs in all). Even though this is the best of the series, it’s still slapdash B-western filmmaking from Sig and Sam Neufeld (aka Peter Stewart). 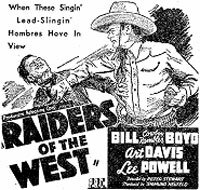 “RAIDERS OF THE WEST” (‘42 PRC) The Frontier Marshals bust up a gang of counterfeiters holding a girl’s engraver father hostage at a spook ranch. Trio westerns were clicking with Saturday matinee kids, so PRC figured one more trio would do just as well, hence the teaming of former serial Lone Ranger Lee Powell, Art Davis who had fiddled around in Gene Autry, Bill Elliott, Jack Luden and Tim McCoy B’s and, from Dallas, TX, Bill Boyd whose western swing band struck gold on RCA with “Under the Double Eagle” in ‘38. PRC dubbed him Bill “Cowboy Rambler” Boyd to avoid any misidentification with William “Hopalong Cassidy” Boyd. “ROLLING DOWN THE GREAT DIVIDE” (‘42 PRC) With WWII, there’s a stepped up demand for horses for the U.S. Cavalry alongside of modern tanks and trucks. But with that demand comes the renewed activities of those jackals of the plains—horse thieves. As the Frontier Marshals investigate, there’s a lot of prolonged stuff abut a short wave set in a traveling recording studio operated by the rustlers. Some interesting ideas aren’t very well executed and, even with a fair amount of action, the film seems to drag on and on under Peter Stewart’s (aka Sam Neufeld/Newfield) mundane direction. 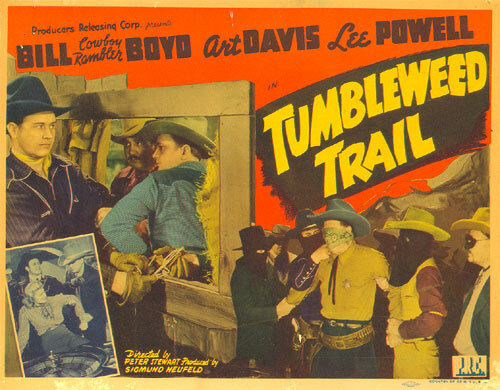 “TUMBLEWEED TRAIL” (‘42 PRC) The Frontier Marshals come to an Oklahoma border town to extradite outlaw Charlie King, eventually joining the ranchers to oppose King, his boss Jack Rockwell, crooked sheriff Frank Hagney and even Rockwell’s daughter, Marjorie Mannors (a very bad actress, she nevertheless stayed very busy at PRC, Monogram and Republic from ‘42-‘47.) Masked, like the Lone Ranger he portrayed in the ‘38 Republic serial, Lee leads a vigilante group against the gang. Some nice western swing by Bill Boyd (“Tumbleweed Trail”) and Art Davis (“Lazy Moon”). “PRAIRIE PALS” (‘42 PRC) Shoddy production values even by PRC standards. You can hear mumbling, off camera background voices several times during the course of the film, the worst being just as Art Davis bulldogs an outlaw off his horse. Listen for him (or his stunt double) to yell, “Here we go!” Marshals Davis and Boyd infiltrate a gang led by saloon owner I. Stanford Jolley (listen for him to fluff a line—no retakes). Jolley is having his men hold prisoner in a cave a chemist who knows the secret of turning ore into synthetic gold. The chemist’s daughter poses as a waitress in Jolley’s establishment hoping to get a lead on where the badmen have stashed her Pop. 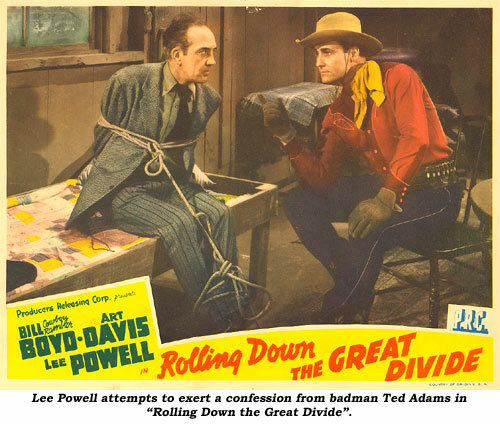 Not faring well in busting up the gang, Art and Bill send for their pal, Marshal Lee Powell. There is one clever scene in the saloon where Art picks out Morse code on his guitar strings for Powell to pick up on. 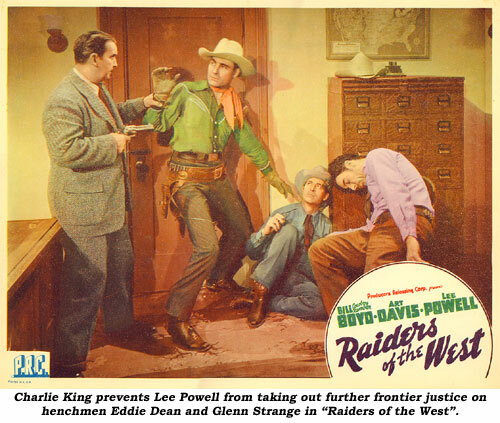 Several songs as usual, including “You’ll Be Sorry” written by Fred Rose and Gene Autry and “Prairie Moon” previously used in Fred Scott’s “Songs and Bullets” (‘38). 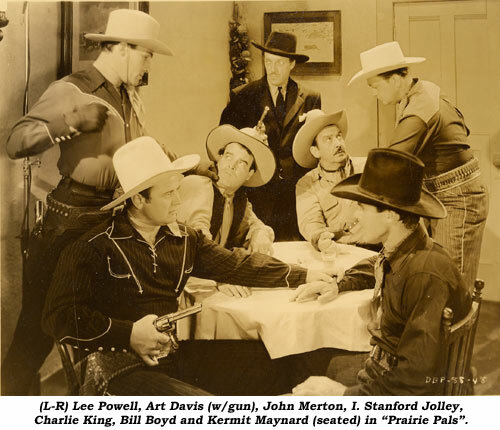 PRC let no grass grow under Al “Fuzzy” St. John’s feet—he squeezed in an appearance here (unbilled) as leader of the ranchers while simultaneously sidekicking with George Houston in the Lone Rider series and Buster Crabbe in the Billy the Kid films. Fuzzy made 17 films in ‘42, even moonlighting away from PRC for some Don Barrys at Republic and a role in the big budget “Valley of the Sun” at RKO. “ALONG THE SUNDOWN TRAIL” (‘42 PRC) The last of the Frontier Marshals six-film series has Powell, Boyd and Davis out to stop the hijacking of tungsten ore wagons. Charlie King, as nasty, mean and murderous as ever, and his gang are looting, plotting and murdering to get the ore by substituting their own worthless “stuff”. The Frontier Marshals series was not a top priority item even at lowly PRC, and, as usual, there are a few lapses in continuity you could ride a horse through. Even by PRC standards, the six Frontier Marshals titles epitomize the ultimate nadir in ‘40s B-western filmmaking. In one entry it’s pathetically obvious with just plain weird courtroom “humor” that seems more suitable to a Marx Brothers comedy. Davis and Boyd’s songs often seemed more “country” than “western”. In “Raiders of the West” Boyd warbles a cheerful ditty asking, “Tell me Mommy, why my Daddy don’t come home”. Then, when Davis does do a western tune, it’s appalling: “It’s pretty aggravating, when your horse lopes along like a snail.” So, after six embarrassing outings, producer Sig Neufeld sent the Marshals packing. Subsequently, Marine Lee Powell was killed in WWII. Bill Boyd returned to Texas with another million seller, “Lone Star Rag” (‘49), and continued performing until he suffered a stroke in ‘73. He died in ‘77. Davis, who had played clarinet, fiddle, guitar and other instruments with not only Boyd prior to their films together, but with Milton Brown, the Light Crust Doughboys and others, joined the Navy. After his discharge in ‘45, he headed for Tulsa, OK, where he formed the Rhythm Riders band. He died in ‘87, but not before seeing a resurgence in his music and even a certain appreciation for his film work at several Memphis Film Festivals in the early ‘80s.